In our community, 1.5 million residents depend on water delivered by the Las Vegas Valley Water District. Just as Las Vegas never sleeps, neither do we. Behind the scenes, we're investing to maintain, expand and upgrade reservoirs, pumping stations and pipelines to keep our community's water system eight times more reliable than the national average. The reliability AND quality of your water is our priority: 24 hours a day, 7 days a week. WATER DELIVERED BY THE LAS VEGAS VALLEY WATER DISTRICT MEETS OR SURPASSES ALL STATE OF NEVADA AND FEDERAL SAFE DRINKING WATER ACT STANDARDS. Read this report, provided in accordance with the Safe Drinking Water Act, and get the facts: Learn where your water comes from, what's in it, how it's treated and delivered through one of the most technologically advanced municipal water systems in the nation, and more. You'll find additional water-quality information on our water quality reports page. Your 2018 report is based on data collected during the 2017 calendar year, unless noted otherwise. If you have questions, please email us or see the For More Information heading below for more consumer resources. In 2017, we conducted more than 300,100 analyses on 55,250 water samples—going beyond state and federal requirements to ensure your water quality and safety. We sample and test water from Lake Mead, from our storage reservoirs and from 367 sampling stations throughout our distribution system. Some stations are aboveground; others are installed in customers' meter boxes to help ensure water quality is maintained all the way to your tap. We treat water drawn from Lake Mead at the Southern Nevada Water Authority's two advanced water treatment facilities. 76 production wells and 26 recharge wells that can produce more than 200 million gallons of water daily. Because water drawn from the Las Vegas Valley groundwater aquifer is naturally filtered, it is simply treated with chlorine as it enters the distribution system. Under the Water-Quality Test Results heading below, you'll view results of our 2017 testing and analyses. We monitored for 91 regulated contaminants as required by the U.S. EPA; 76 of these have "primary" standards and are listed in this report if they were detected in our water supply. Visit our water quality reports page for a complete Water Quality Summary, which shows all monitoring results, including information beyond what is required in this report. Or, contact our Water Quality Division at 702-258-3215. Many large water systems, including ours, also monitor for certain constituents that the EPA is considering for regulation; view the information we provide to the EPA in the "Additional Test Results" chart in the Water-Quality Test Results section below, in compliance with the Unregulated Contaminant Monitoring Rule. In 2017, we also monitored for more than 75 unregulated contaminants, including substances such as pharmaceutical compounds and perchlorate, which currently have no "limits." We also monitor for Cryptosporidium. The EPA requires water systems that treat surface water to ensure removal of this naturally occurring organism that can cause gastrointestinal distress. Cryptosporidium was not detected in any 2017 source (untreated) water samples. These terms are used in the table of water-quality test results. Locational running annual average: The average of sample results taken at a particular monitoring location for the previous four consecutive quarters. Ozonation: An advanced water treatment process that involves the addition of ozone, a very powerful gaseous disinfectant, to water to destroy bacteria, Cryptosporidium and other pathogens. Ozonation processes began at AMSWTF and RMWTF in 2003. These results represent levels of regulated contaminants in the treated water supply, based on 2017 data, except where noted. Visit our water quality reports page for a complete Water Quality Summary. In compliance with the Unregulated Contaminant Monitoring Rule (UCMR), these results represent levels of monitored contaminants in the treated water supply, based on 2014 data. Some Safe Drinking Water Act (SDWA) regulations require monitoring from the distribution system, while other SDWA regulations require monitoring at the entry points to the distribution system (LVVWD wells, AMSWTF, RMWTF). This result is not a violation of the MCL. The MCL for alpha particles is based on net alpha particle activity, which excludes uranium’s contribution to alpha particle activity. One well in 2017 had a gross alpha particle result of 16 pCi/L. In that sample, uranium’s contribution to alpha activity was 1.6 pCi/L. When the uranium contribution was subtracted from the gross alpha particle activity, the net alpha particle activity was 14 pCi/L (below the MCL). SDWA regulations require additional monitoring for radium-226 if gross alpha particle results are greater than 5 pCi/L; all radium-226 test results were below the detection limit (1 pCi/L). This result is not a violation of the MCL. Maximum levels greater than the MCL are allowable as long as the running annual average does not exceed the MCL. Annual monitoring not required, data from 2016. By state law, the Southern Nevada Water Authority is required to fluoridate the municipal water supply. This law is not applicable to groundwater. Chlorine is regulated by MRDL, with the goal stated as a MRDLG. This value is the highest locational running annual average reported in 2017. Reports are filed quarterly. While your drinking water meets EPA standards for nitrate, it does contain low levels of nitrate. Nitrate in drinking water at levels above 10 ppm is a health risk for infants of less than six months of age. High nitrate levels in drinking water can cause blue baby syndrome. Nitrate levels may rise quickly for short periods of time because of rainfall or agriculture activity. If you are caring for an infant, you should ask for advice from your health care provider..
Turbidity is regulated by a Treatment Technique (TT) requirement: 95% of all samples taken after filtration each month must be less than 0.3 NTU. Maximum turbidity cannot exceed 1.0 NTU. Monitoring for each of the monitored contaminants in the Additional Test Results table was conducted to comply with the Unregulated Contaminant Monitoring Rule (UCMR) set by the U.S. EPA Safe Drinking Water Act. Per the rule, monitoring is conducted within the Distribution System only. Unregulated contaminant monitoring helps the U.S. EPA to determine where certain contaminants occur and whether the Agency should consider regulating those contaminants in the future. With the exception of Chromium (Total), these contaminants have no MCLs or MCLGs. Monitoring for this regulated contaminant was performed under the UCMR3 at lower detection limits than are required under current monitoring rules. Monitoring for Chromium (Total), in conjunction with UCMR3 Assessment Monitoring, is required under the authority provided in Section 1445 (a)(1)(A) of the SDWA. All water originates from a source. Sources for both tap water and bottled water include rivers, lakes, streams, ponds, reservoirs, springs and wells. As water travels over the surface of the land or through the ground, it dissolves minerals and—in some cases—other contaminants, and can pick up substances resulting from the presence of animals or from human activity. Tap water, as well as bottled water, may reasonably be expected to contain at least small amounts of some contaminants—any substances that are not H2O. It's important to understand that the presence of contaminants does not necessarily indicate that water poses a health risk—particularly in light of claims made by some home water-treatment companies and reports about water quality or the environment. Radioactive contaminants, which can occur naturally or as a result of industrial activities. To ensure tap-water safety, EPA regulations limit the amount of certain contaminants in water provided by public water systems. Learn more by calling the EPA Safe Drinking Water Hotline at 800-426-4791 or the Nevada Division of Environmental Protection at 775-687-9521. Food and Drug Administration regulations establish limits for contaminants in bottled water, which must provide similar protection for public health. The federal Safe Drinking Water Act was amended in 1996 and requires states to develop and implement source water assessment programs to analyze existing and potential threats to the quality of public drinking water throughout the state. A summary of the Las Vegas Valley Water District’s susceptibility to potential sources of contamination was initially provided by the state of Nevada in 2003. The summary of this source water assessment was first included in the LVVWD 2004 Water Quality Report; the summary now may be accessed on our water quality reports page. Some people may be more vulnerable to contaminants in drinking water than the general population. Those with compromised immune systems such as cancer patients undergoing chemotherapy, people who have had organ transplants, those with HIV/AIDS or other immune-system disorders, some elderly and infants can be particularly at risk from infections. These people should seek advice from their health-care providers about drinking water. Call the Safe Drinking Water Hotline at 800-426-4791 for Environmental Protection Agency/Centers for Disease Control guidelines on appropriate means to lessen the risk of infection by Cryptosporidium and other microbial contaminants. Is My Water "Hard?" Why? Many Western cities, including Las Vegas, have "hard" water supplies. That's because we share the same primary water source: the mineral-rich Colorado River. Naturally abundant, harmless calcium and magnesium dissolve as the river flows. As a result, you may notice a taste difference. However, your "hard" water (281 parts per million or 16 grains per gallon—a slight decrease from 2016 levels) poses NO health risk and meets ALL standards for water quality. What About Taste? Any Tips? Try an activated carbon filter, like those in carafe systems, for a few dollars more. These filters can improve taste, but don’t remove hardness, minerals, sodium or fluoride. Should I Use a Water-Treatment System? Supplemental home water treatment systems aren't necessary, but may improve aesthetic qualities such as taste and hardness. Make an informed choice: Contact the Southern Nevada Water Authority for a free Consumer Reports® filter buying guide and fact sheets on filtration and home water-treatment systems. Call 702-258-3215 or visit snwa.com. This may sound odd, but air—yes, air—is likely the culprit if your water looks "cloudy!" Air can become trapped as water travels through pipelines, which are pressurized. When you open your faucet, you release the pressure, much like opening a bottle of soda. Thousands of tiny air bubbles can give water a cloudy appearance, but won’t diminish water's quality and safety—and won't harm plumbing. Have one minute? It's easy to test whether cloudy water is due to trapped air. Fill a glass with tap water and set it on your counter. Observe the water. As the air dissipates, water should start to clear up. The Las Vegas Valley Water District's water infrastructure doesn't contain lead service lines or other lead components, and local water providers maintain robust corrosion-control programs developed in coordination with the Nevada Division of Environmental Protection. These efforts help maintain water quality by preventing possible contaminants from leaching into the water system. Inhibiting the corrosion process also helps extend the life of underground pipes, valves and other critical infrastructure used to deliver water to you. Learn more on our water quality reports page. The state of Nevada and the EPA require public education for lead and copper, and the Water District monitors for both. Your water meets state and federal requirements for lead, but if present at elevated levels, lead can cause serious health problems, especially for pregnant women and young children. Lead in drinking water is primarily from materials and components associated with service lines and home plumbing. 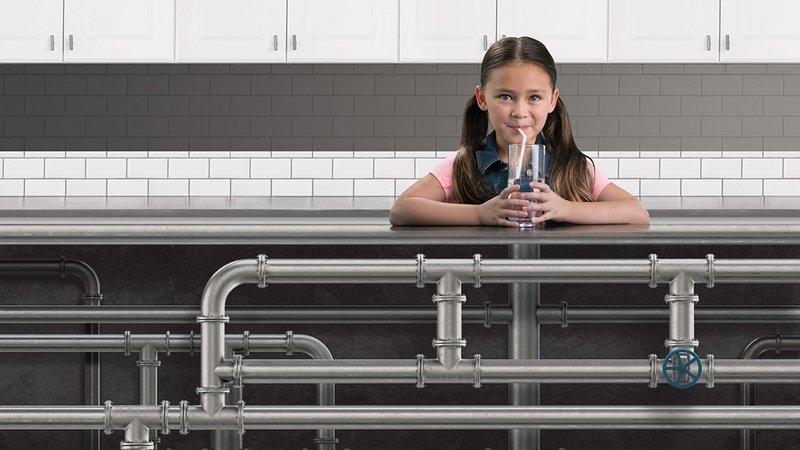 The Water District is responsible for providing high-quality drinking water but cannot control the variety of materials used in plumbing components. Homes built before 1986 are more likely to have lead-based components. When your water has been sitting for several hours, minimize the potential for lead exposure by flushing your tap for 30 seconds to 2 minutes before using water for drinking or cooking. If you are concerned about lead in your tap water, have your water tested by a private laboratory. For more information, call the EPA Safe Drinking Water Hotline, 800-426-4791, or visit epa.gov. Este reporte contiene información muy importante acerca de la calidad del agua. Para recibir una copia en español, llame al 702-258-3946 o visita lvvwd.com. The Las Vegas Valley Water District’s mission is to provide world class water service in a sustainable, adaptive and responsible manner to our customers through reliable, cost-effective systems. The Las Vegas Valley Water District has one of the nation's most reliable water delivery systems—and that supports higher water quality, too. Instances of water main breaks in Southern Nevada are below the national average and our water system has a world-class efficiency rating. Over the next decade, the Water District will invest more than $600 million to proactively maintain, upgrade and expand our community's drinking-water system. Two-thirds of these capital projects focus on repairing and replacing aging water-system components. The balance is split between water-quality protection and new water facilities. Hybrid financing strategies help keep water service affordable. By investing now in our water distribution system, our community saves millions of dollars in emergency repair actions, with far less disruption to residents.